Sen. Mike Lee has a plan to defund key parts of ObamaCare. : Sadly, D.C. infected GOPers like the congressman in this story don’t have the stones to put up a fight! Talking Points Memo reports Rep.: Robert Pittenger (R-NC) received an earful Monday at a town hall after he said that he will not be backing efforts to defund Obamacare and risk a government shutdown. The exchange was captured and posted by the tea party website ConstitutionalWar.org. 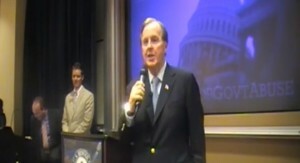 A man off camera can be heard asking Pittenger about the defunding effort spearheaded by Sen. Mike Lee (R-UT). “Do you want the thoughtful answer?” Pittenger asked. “I want yes or no,” the man said. Pittenger then said “no,” a clip that the tea party website re-played in slow-motion. The lawmaker then had a back-and-forth with the man and a woman, who was also off camera. “Do you think Harry Reid is going to pass that in the Senate?” Pittenger asked. “It doesn’t matter,” the man fired back. “We need to show the American people we stand for conservative values,” the woman shouted, drawing a smattering of applause. I’ve been commenting on Facebook for the past week that this schism inside the GOP over Obamacare funding may be the impetus conservatives needs to leave the GOP in droves and start a Third Party. It has become obvious the Republican Party wants to be a Democrat-lite Party and conservatives will never ever abide with that.